Are you thinking of building a small structure as your new backyard barn, garage, hobby shop, small animal shelter, workshop, yard barn or country store? Architect Don Berg's little pole-barn and pole-frame garage blueprints are all designed to be easily modified to fit your needs. Scroll down this page to see a few of the beautiful little buildings that customers and their contractors created with the help of Don's plans. Click on the photos to learn more, to see what the original stock plans look like and to find out how to start on your own custom barn, garage, workshop, studio or...whatever. 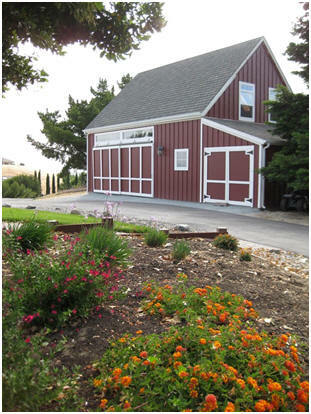 All of architect Don Berg's mini-barn designs have traditional proportions, storage lofts and sturdy braced post frames. 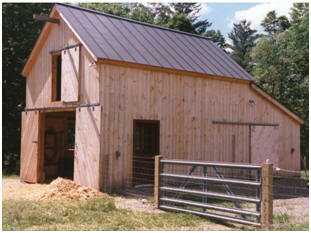 The angle braces give the interiors the look of old-time timber-frame barns. 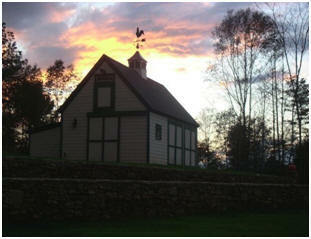 This pretty example of the Candlewiood Mini-Barn, was built as a garden shed in Washington State. Cold Spring Barn - This little tractor barn, set in an apple orchard in northern Vermont was built with extra windows, a roofed shelter and finishes that matched old barns in the area. 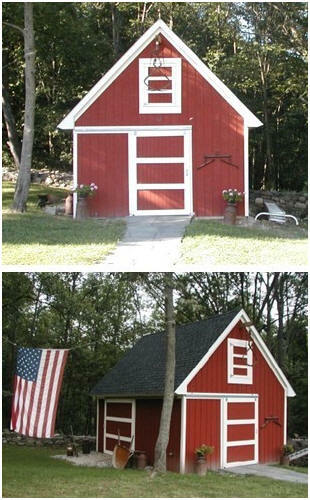 This Candlewood Mini Barn was built in Overbrook, Kansas to store a couple of small tractors and garden tools. The owner added a fantastic lookout cupola. Candlewood Mini-Barn Garage - The standard Candlewood Mini-Barn has a garage door on it's eave side and a small shed opposite that. 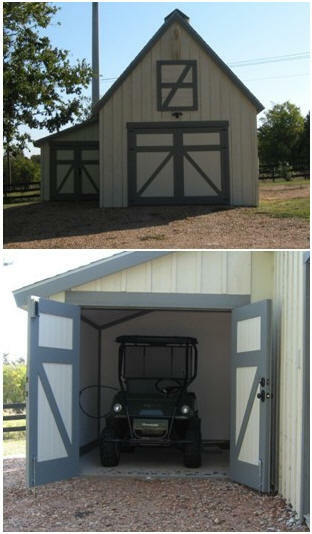 The builder of this little barn, in Brenham, Texas, put doors on the shed to create a perfect size ATV garage. 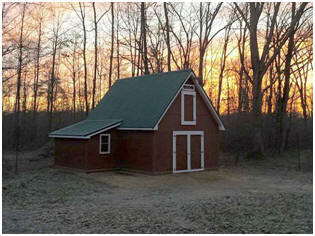 Woodbury Barn - Here's a fairly standard Woodbury pole-barn built in Alabama by a talented photographer. 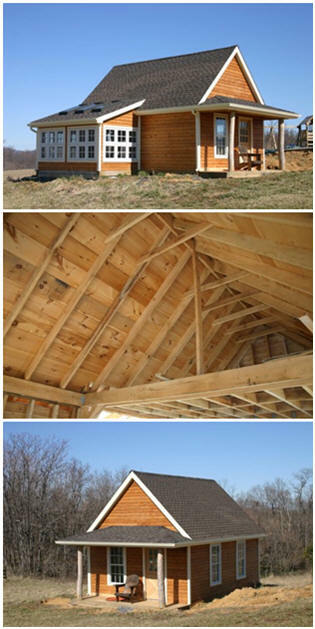 Cold Spring Barn - The builders of this little Wisconsin barn added a sheltering roof area and a finished loft to our standard plans. You can see the loft before and after it was converted into a home office. Candlewood Potting Shed - This beautiful gardener's potting shed, built in Shepherdstown, West Virginia, is the stock Candlewood Mini-Barn with an added porch and a bunch of extra windows. 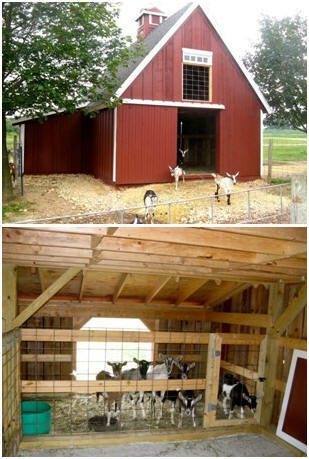 Candlewood Mini-Barn - The owners of Edwards Apple Orchard in Poplar Grove, Illinois built this Candlewood Mini-Barn with a steeper-than-standard roof a custom cupola and pens for their pet goats. 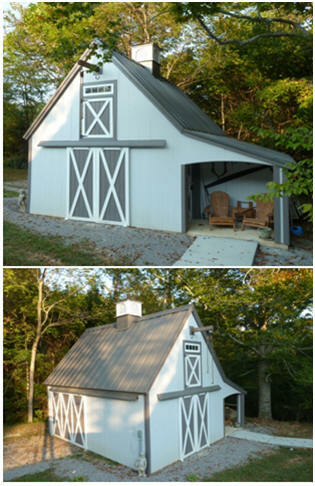 Tennessee Yard Barn - Here's the stock Candlewood Mini-Barn made nicer with a little shaded shelter at back. 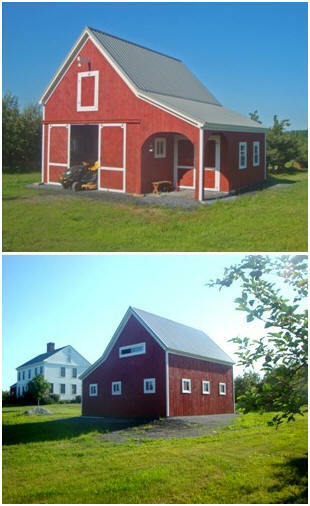 Candlewood Shed - Here's a mirrored version of the standard Candlewood Mini-Barn plans, used as a lawn tractor shed in Middletown, New York. Candlewood Mini-Barn Here's what the standard Candlewood Barn should look like. 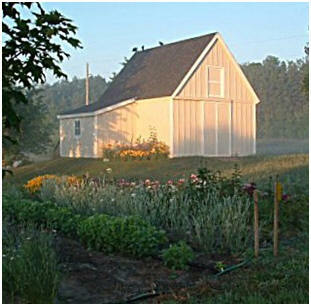 A blog article shows one man's construction progress for this little barn on a flower farm in northern Michigan. Take a look at Building My Small Barn on the Thin Man's Blog to check out the step-by-step process of building this little pole barn.